Summer Suit fabrics to keep you cool: lightweight wools, silks, mohair, cottons and linens. Irish linen is considered the best and the least likely to crease. All offer the opportunity to have a very sharply cut bespoke suit that will keep you cool, and smart, in the summer. This photograph is a fabulous photograph taken by The Sartorialist. 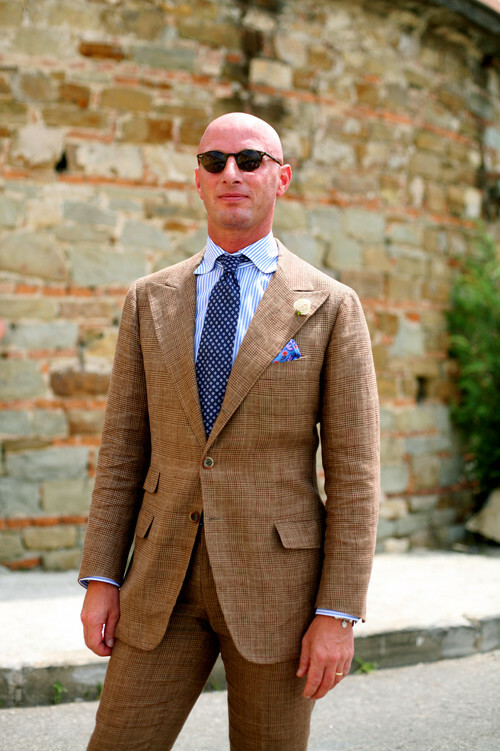 The Image (C) – The Sartorialist. See also: best summer suits, Donegal, donegal ireland, english linen, fabric, fabric source, Henry Herbert Tailors, Ireland, irish linen, lightweight wools, linen, linen fabric, linen summer suits, men s summer suits, men summer suits, mens suits for summer, mens summer linen suits, mens summer suits, mens summer suits 2012, mens summer wedding suits, mens summer weight suits, mens wedding suits summer, mens white summer suits, mohair, suits for summer, summer business suits, summer linen suits, summer men suits, summer mens suits, Summer Suit, summer suits, summer suits for men, summer suits for men 2012, summer suits for weddings, summer suits men, summer suits mens, summer wedding suits, summer wedding suits for groom, summer wedding suits for men, summer wedding suits men, summer weight suits, weddings mens suits, weddings suits for summer. Linen Suit - Summer Suits to keep you Cool. Henry Herbert Tailors make a variety of summer suits - from cotton suits, linen suits and mohair suits - perfect cool fabrics for the summer.